Seventy-four years later, Rusinek is still passing it on, asking military members and their families the same question that he had been asked in that diner booth all those years ago. Over the past seven decades, Rusinek has purchased meals for military members almost every time that he and his family dine out. As his 92nd birthday neared, Edmund wanted to celebrate by doing the thing that makes him happiest – spreading kindness to others. A regular Saturday morning guest at Chick-fil-A Shops at Rossmoor in Seal Beach, California, Edmund often met active duty service members when he came in for breakfast. 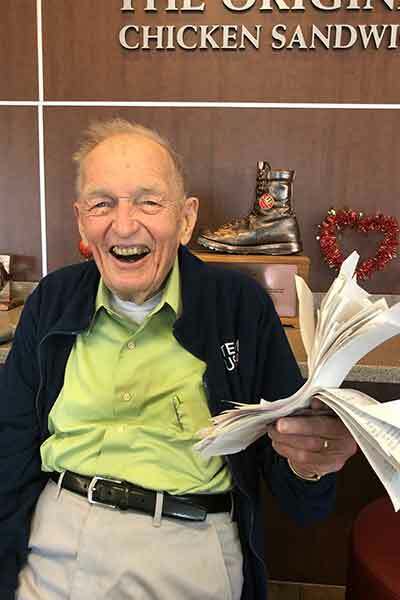 The restaurant, located near an Air Force base and Navy base, serves scores of military members and their families daily, which made it the perfect place for Edmund’s grand gesture. Rusinek shared his plans with Giola Arkis, restaurant manager at Chick-fil-A Shops at Rossmoor. When she agreed to his request, he gave her some cash and asked that she use it to pay for the meals of any military members and families who visited the restaurant that day. After just a few hours, Arkis called Edmund to let him know the money had run out. To her surprise, Edmund showed up at the restaurant the next day with a smile on his face and his credit card in hand. He spent the next three hours buying meals for military members and their families, shaking hands, sharing stories and taking photos. The day came full-circle when the entire restaurant, full of men and women in uniform, sang “Happy Birthday” to him. Restaurant Team Members, service men and women and guests that day were equally inspired by his gesture, and the entire restaurant was overcome with a joy that was impossible to ignore. In tradition, Edmund’s only wish is that those who hear his story are inspired to pass it on. It started with a text message. Brennan Scoggins, a 25-year-old petty officer third class boatswain’s mate for the Navy, was returning home to Jacksonville, Fla., after spending seven months deployed at sea in Scandinavia. Scoggins was close to his 321 fellow sailors and, having survived on mess deck food for so long, he wanted to give them a gift upon their arrival.